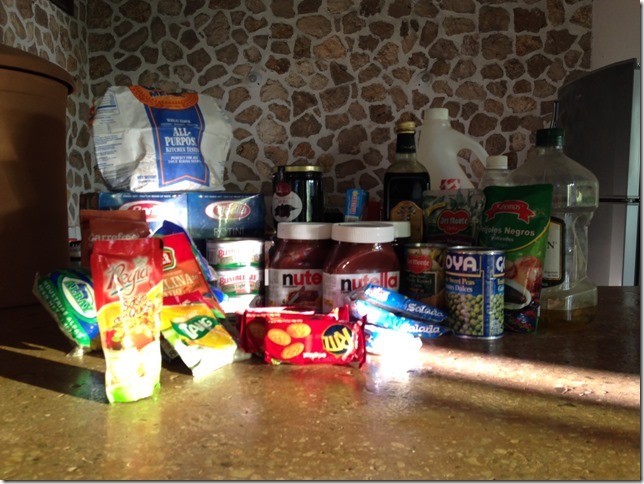 I am was on a challenge to buy no groceries except fruits and vegetables for a full month. I decided to enter the challenge after I’d gone back home to the jungle, mostly because I hate going shopping all the time (on a normal month I last 10-15 days between supermarket runs) and also because I’m only here for a month, and my house is hot and humid, so products go bad quicker than usual. So far the first two weeks, I only bought about $10 worth of fruits and veggies, hoping they’d last through the rest of the month. The third week was miracle week, as two groups of Airbnb guests checked out leaving behind a ton of goodies. The first group left two bottles of wine, half a bottle of vodka, and ice. The second group left lemons and beers. Seriously. They also left a few sausages, refried beans, which I eat for breakfast, usually made from scratch, so they saved me time and effort, and a whole lettuce. As I was done with mine, having a fresh one was awesome, and helped me avoid the store one more week. And as I was wondering what life without mayo may look like, they also left me a tub of mayo! Even though it was the light, olive oil healthy version, I was super happy. I ran out of orange juice and replaced it with Tang and smoothies. I ran out of cream cheese, which I had used instead of mayo to make turkey breast sandwiches, but I ran out of turkey breast too, so didn’t miss the cream cheese too much. Without the guests’ gifts, I would probably have needed a lettuce, and while at the shop, gone for a few fruits as well. I also didn’t go through my stockpile as quickly as I thought because of all the goodies. And beer + Ritz crackers might have been an acceptable dinner menu a few times since the start of the challenge.. I was looking forward to a fresh supply of fruits and veggies for week 4, as my diet had become pretty boring. But I decided to go traveling at the end of the month, and the food supplies were enough to last me until then, calories wise. Buy more, and I would waste part of it, or have to give it away. So I made do with what I had. Plus, my fridge broke, so for a few days it acted barely as a cooler, and I didn’t want to add more food to spoil in there. I made it through the month with one $10 fruit and vegetables refill. I would have gone with two had I not gone traveling at the end. 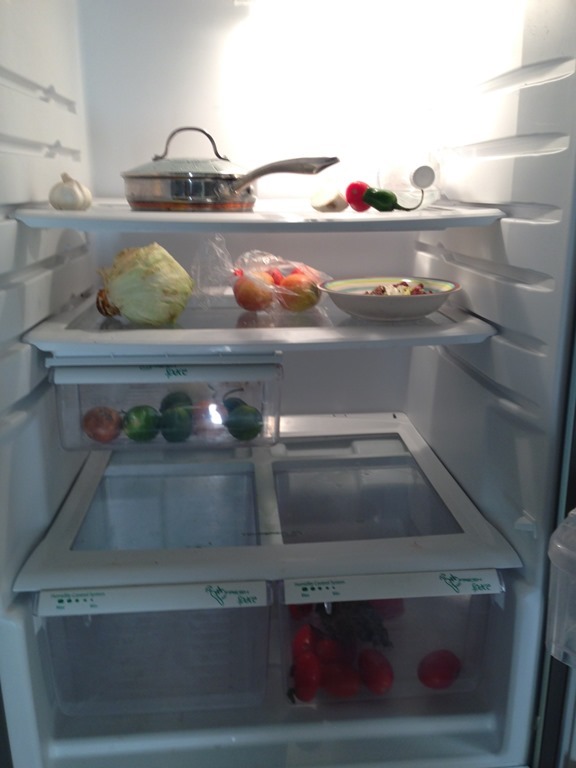 The fridge had never looked so empty. Dry goods: I still have a lot, but most of it won’t spoil when I go traveling. I can keep tackling that when I come back. I even have a bit of flour that I kept in case I had bread withdrawal syndrome, and managed to make do without it. Frozen stuff: The meat is all gone, bacon, turkey breasts, some sweet and sour duck I’d kept since August, and the half pound of beef. I had 5lb of shredded cheese, which I went through almost every day (cheesy fries, yum! ), but that was too much, so the cheese still remains. 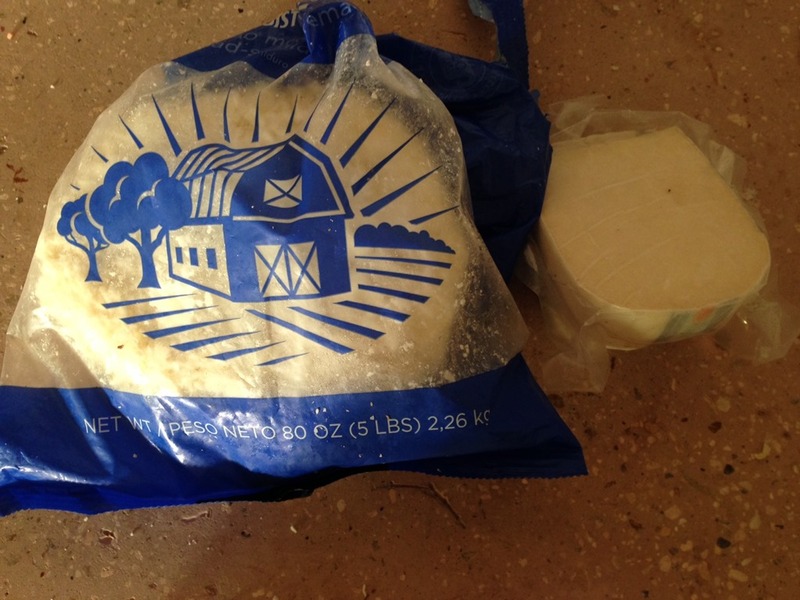 I can now close my house and turn off the fridge and freezer, taking just the cheese with me, and saving a bit on utilities while I am away. 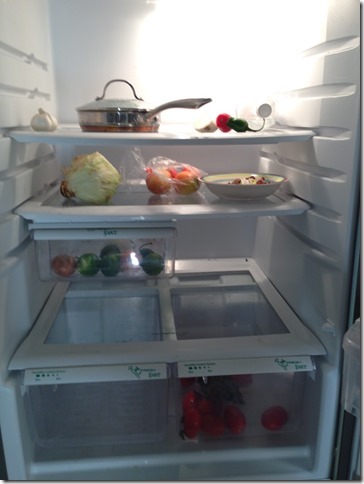 Usually I keep the deep freezer on and one fridge, so that’s quite a bit of electricity there. 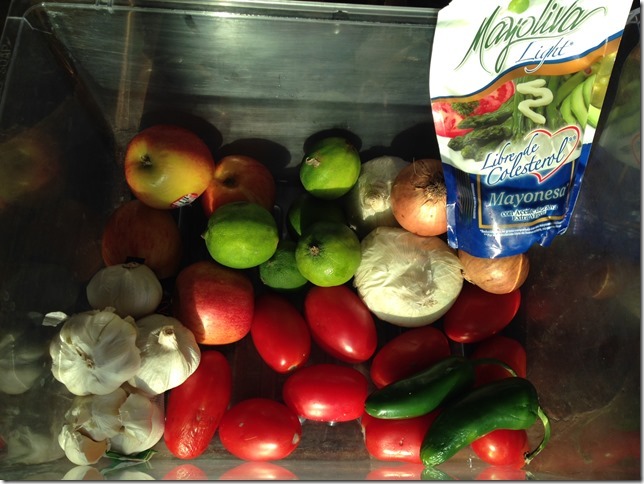 Fresh food: As I leave tomorrow, I only have a few veggies, and the tub of mayo that magically appeared after guests left. No more eggs, OJ, cream cheese… I think I did pretty well considering I didn’t have these travel plans at the beginning of the month. I’ll give it all to my staff to avoid waste. 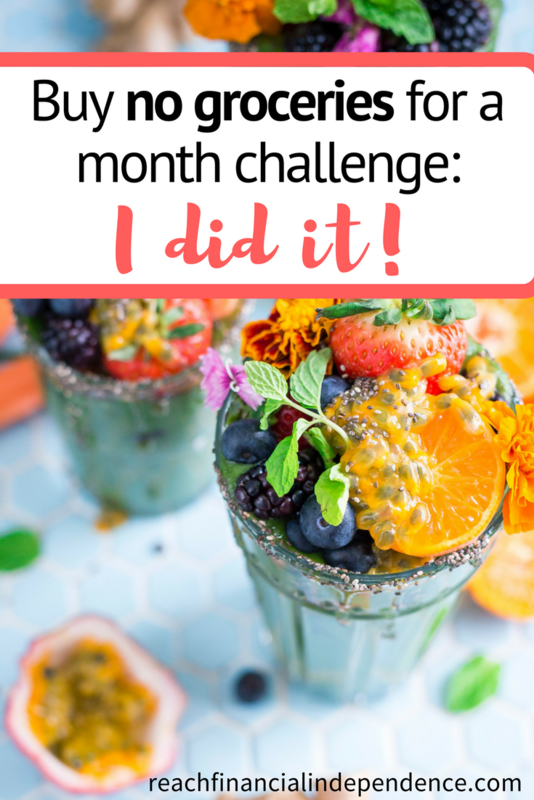 Overall, this challenge has helped me get creative with the food I had, like when I had guests, and the major win is to be able to turn off the fridge and freezer for the next two months. But I missed the healthy veggie based diet I’m used to having. So the lesson here is I should stop hoarding, buy meat and dry goods for 2 weeks tops, which is usually the maximum amount of time I spend without going to the shops. And if I spend longer, shop local, my village only has the basics at a 25% mark-up, but it will do for a few days. Having no coupons or other incentive here, stockpiling is not a good idea, as everything spoils with the heat and humidity. Yay! Good luck Pauline! I hope you’d be successful in this challenge! Have fun! Hi Pauline!!! I thought I would pop by! You are doing great! Yes Someday I will rent your space!!! Ahem, I have also been known to have wine and crackers for dinner 🙂 Nice work saving on food and have an awesome trip!